Fortnite update 1.73 is now available for players. According to the Fortnite 1.73 changelog, the new update includes new features as well as fixes for issues related to framerate drop, server performance, and more. In addition, Fortnite version 1.73 also includes stability and performance improvements. Check out more details below. Recently, an update was released with minor changes and fixes. Unfortunately, after this patch, many players were experiencing a number of issues when trying to play the Battle Royale. Today’s Fortnite version 1.73 update is expected to fix all these issues. Open Rifts on-the-go in Battle Royale and take on the new Horde Challenge in Save the World. Escape danger or dive into it! The Rift-To-Go is any player’s ace in the hole, creating a Rift for themselves and allies. Be careful that no enemies follow you through. Deploy your forts and survive wave after wave of enemies as they attempt to pummel your defenses to dust. Complete the Challenge and earn a legendary reward. New Message of the Day format for both Save the World and Battle Royale modes. Added keyboard presets to the keyboard input tab in the settings. Now you can quickly select either the default keyboard controls (Standard) or the original (Old School) controls. Fixed a delay when trying to open the top bar menu immediately after switching to the Store tab. Fixed UI bug where holding down the primary button on a Widget, then moving to a new widget, would result in the current selection disappearing. Fixed issues with burst-fire weapon local ammo amount occasionally being displayed incorrectly when equipping or unequipping while firing. The shader cache now adjusts how many shader entries are processed each frame based on how long it takes to compile each shader. This makes the process faster when the operating-system or driver has internally cached the shaders on a previous run. Fixed an issue causing autorun to immediately turn off after being toggled on. Modified the Options screen so that player inputs will not immediately cause it to close during gameplay. Fixed reticle hit notify image appearing when switching quickly from a melee weapon to a ranged weapon after inflicting damage. Fixed an issue that occasionally allowed weapons to display ammo in the magazine if all ammo was dropped while reloading. Fixed an issue with trying to fire while opening a door, which was causing a fire animation to play without the weapon actually firing. Smoke generated from the destruction of objects is now 50% more translucent than before, increasing visibility close up. Earn points by collecting coins, opening loot containers and eliminating other players. The first to cross the High Score threshold wins the Victory Royale! Playground has been updated with a couple dozen new ATK’s available, some more ramps to jump them off of, and a handful of new Rifts scattered throughout the map. Head to the hilltops and see if you can find them all. Rift-To-Go is a portable Rift that can be carried in inventory and deployed immediately. When activated, you are teleported into the sky and placed in skydiving mode. The Rift will remain at the location it was deployed for 10 seconds, allowing other players to use it. Epic rarity. Drops in stacks of 1 with a max stack size of 2. Can be found in chests, Vending Machines, Supply Drops and Loot Llamas. Clingers will no longer explode if the object they are attached to is destroyed. They will be affected by gravity and fall until they stick to another object or their fuse expires. Impulse Grenade max stack size increased from 8 to 9. Bouncers now need line of sight of a player to activate. Damage Traps will now properly affect enemy players who are within their range. Remote Explosives now damage everything in their radius that can be destroyed. Added the ability to use Emoticons and Squad Comms while knocked down. Combat and Builder Pro Configs: Added functionality to the right stick click action that will cycle available traps if the player isn’t repairing or rotating a build piece. Added an option to auto-sort consumable items to the rightmost empty quick bar slot when picked up. Added smoothing to motion controls on platforms that support it. Lowered the dead-zone used for aiming on Xbox One controllers. Tuned controller input and accelerations to allow for more fine tuning when aiming. Vehicles will now fall properly if the structure beneath them is destroyed. Characters who crouch and uncrouch will no longer cause visual or hitbox inconsistencies. Fixed an issue causing 0 damage number to be displayed. Players affected by network issues such as packet loss are now limited in how far they will move until the connection is stable again. Additionally, fixed some inconsistencies with how far and fast players could move under these conditions. 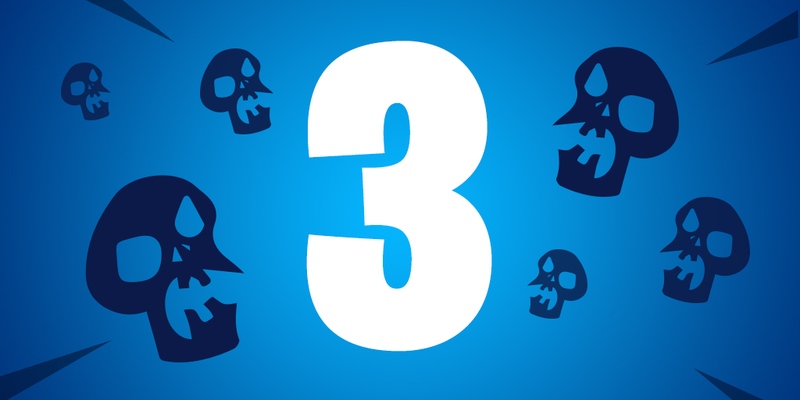 When health and shield damage occur at the same time, they will now be combined and displayed as a single shield damage number. Fixed an issue with controller aiming where the input was not properly scaled when aiming down sights or aiming with a scoped weapon. This will slightly increase sensitivity when aiming down sights or with a scoped weapon. Players will no longer emote with their pickaxe in hand. Fixed issue where damage would always show blue numbers when a player’s shield amount would get stuck at a value between 0 and 1. Fixed some shrubs and bushes that took more swings to harvest then intended. They will now be destroyed after the intended number of swings. Weapons will now auto reload if they are equipped and their ammo type is looted. 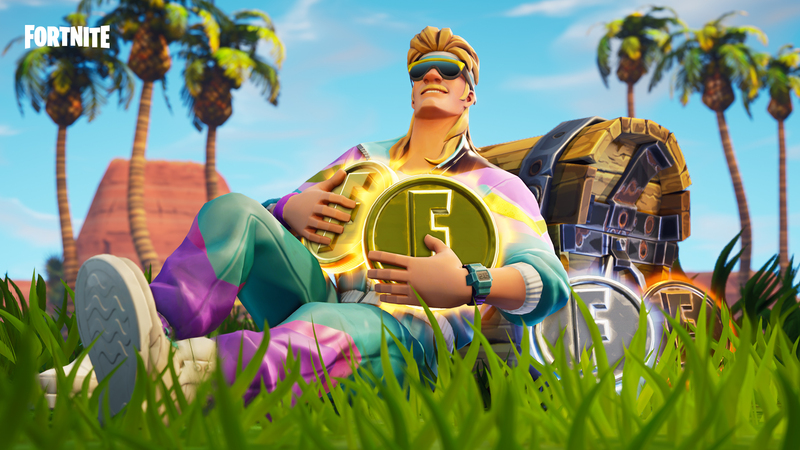 Vending Machines now display the proper costs in the Playground LTM. Fixed some very long hitches seen during long game sessions caused by the Replay System. Optimized loading of Outfits to reduce disk load during the early game (particularly skydiving). This should mean buildings and Outfits load faster. Improved building streaming performance on Xbox One and Switch. This will help buildings load in more quickly during skydiving, reducing the chances of landing on a low-detail model. Improved load times on Xbox One and Switch. Additional stereo content has been added to your own gunfire sounds. Laser Chomp tail swing audio adjusted to more closely match the animation. Emote music no longer breaks when playing back to back emotes. Music now plays properly when using the Hang Time glider. Added a max time for the clock ticking sound that plays prior to the Storm shrinking. Prevents 3 minutes of this sound from playing at the end of a Playgrounds match. Pick Squeak pickaxe now properly squeaks on every hit. Added a display timer and new animation for Item Shop carousel tiles. Health bars for objects with more than 1000 health now display properly. Fixed an issue where you couldn’t use LT/L2 to zoom on the fullscreen map while spectating because it would open the report player window. The ATK now displays the proper controls for players on a gamepad. Fixed an issue where all buses would display as enemy buses on the starter island. Purple trails on Split Wing Glider will now appear properly. Whiteout Outfit now has 100% more neck. The camera will no longer get stuck following the Battle Bus in replays. Shield bar will now properly update after a player is revived. Weapon icons on nameplates will now display properly. Defenders have gone to boot camp and received Defender Training! They now consume 33% less ammunition and weapon durability. Horde Weekly Challenge 3 is now available! This week, prepare your forts for an endurance challenge: 16 waves of shorter wave phases, less time to prepare and faster enemies. 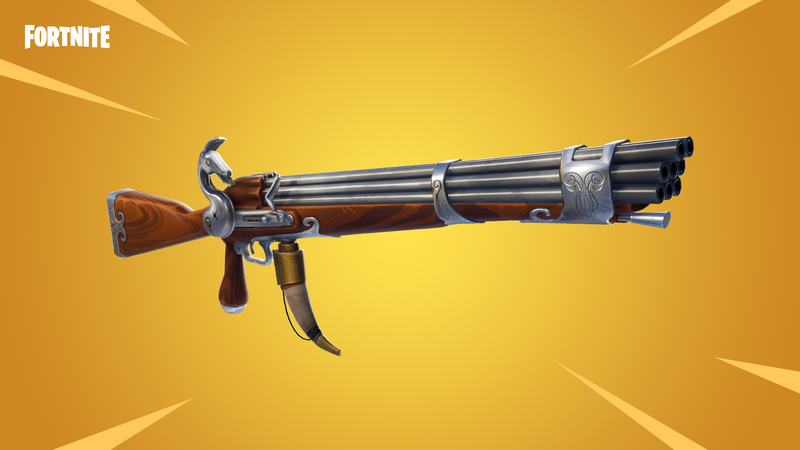 Victorious teams will be able to choose from two legendary Flintlock weapons as their reward. The Horde Weekly Challenge quest is also repeatable for Event Tickets. Shock Tower and TEDDY have been adjusted so that each player may only have one active at a time. This has been indicated in their respective Tooltips. While not currently possible, placing a TEDDY/Tower down while another is active will destroy the presently active one. Each player can still have their own independent TEDDY/Shock Tower active. Fixed an issue that caused the deploy sound for Shock Tower to not play. Fixed issue where Shock Tower’s Tooltip was showing an additional “%” when the Electroshock perk was unlocked. Fixed an issue where stored charge fragments would stop reducing the cooldown of abilities if a player left a mission then rejoined. Fixed issue where Anti-Material Charge would not play its activation sound when the perk Long Arm of the Law was unlocked. Seismic Impact now shows the damage values in the Tooltip. Bundlebuss Assault Rifle is now available in the Weekly Store. Available from August 23 at 4 AM ET to August 29 at 8 PM ET. A surprisingly accurate multi-barreled Flintlock rifle that fires in powerful bursts. Its high damage and large magazine help compensate for a slow fire rate and heavy kick. Fixed 2+ star Weapons and Traps requiring Training Manuals instead of Weapon and Trap Designs to upgrade their rarity. Fixed audio hitching when continuously firing the Cyclone or Monsoon pistols. Fixed an issue where Crossbows were using the wrong pose animation. This caused the weapon to be held too high and interfere with the reticle. Zooming in with a Rocket Launcher will no longer cause it to take up a significant portion of the screen. Fixed an issue where the scope of a Sniper Rifle would remain on screen even after switching weapons. Fixed an issue where enemies wouldn’t attack the camper van in Rescue the Survivor missions. Weekly Challenge Horde Quests no longer give credit for primary Challenge the Horde Quests. Melee swing time Tooltips now read in seconds. Fixed an issue that caused the Reset Building Choice option to always reset building choice, whether the option was selected or not. Fixed an issue that could cause hero abilities to appear multiple times when looked at in-game. Fixed an issue where schematic models would move around when leveling/evolving. Fixed an issue where trap information (amount of traps left) would disappear when the structure it is attached to is upgraded. Fixed an issue that caused multiple missions to appear selected on the map screen. Solo players now get a HUD notification when increasing mission difficulty. Fixed an issue that would cause players loading into a match to be unable to vote for difficulty increases. Fixed issue with the Esc key not closing item management screen or Collection Book after using the Esc key to close a context menu. Fixed an issue where using a controller on the mission selection screen would not scroll correctly. The mission details header now uses the term team power instead of player power. Fixed an issue where your last selected option would reset when exiting the Skill Tree page. Water affliction damage will now correctly show on a player’s chest and not on their feet. Flinger and Takers will now show water affliction damage when afflicted. Fixed an issue where BluGlo would not appear at a distance. Fixed a hitch loading into Horde zones with certain forts. New sounds for the Cyclone pistol added. Fixed an issue where music would drop out during Ride the Lightning missions. Several UI sound updates and fixes. Fixed an issue where sounds would linger over the Victory screen. Fixed an issue where anti-material charge sounds could double up. Fortnite 1.73 has added fixes for crashing and framerate drop issues. Fortnite update 1.73 for PS4 and Xbox One is now available for download.